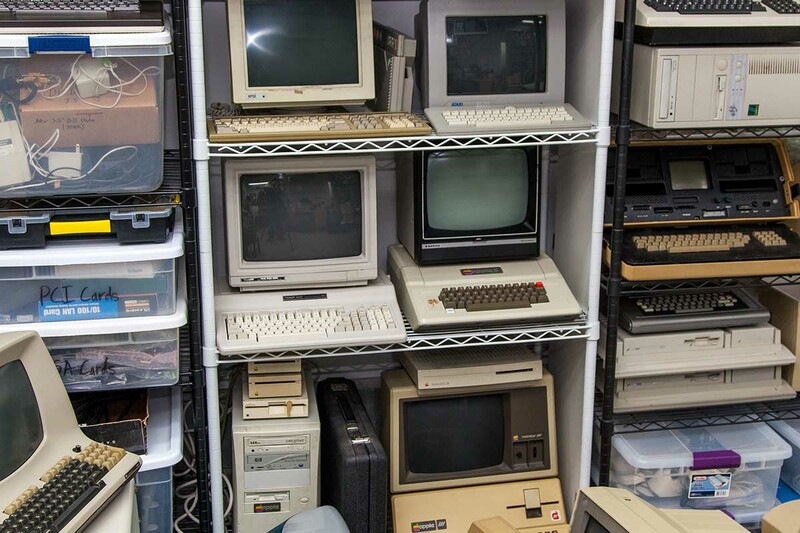 As you stare at the old computers in your business, you may start to debate whether to keep them in your inventory or toss them in the dumpster. Perhaps you already upgraded your primary office technology or are seriously considering it. Before you have someone remove your old computers from the building, though, there may still be some treasures found within that trash. Below is a guide that will walk you through 7 different ways to save or make money for your business with a little help from that dumpster-worthy equipment. With desktop computers, you should always consider keeping the towers and cases that come with them. As you store and save components from other recycled/repurposed computers (such as memory chips, motherboards, hard drives, and CPUs) you may very well end up having enough elements to piece together a functional computer. Instead of allocating a chunk of your equipment budget to buying a new or used computer, you may very well have enough supplies on hand to piece together a functional alternative. Saving the towers and cases from old computers will provide you with the foundation needed to execute this plan successfully. Chances are that some of your employees might be interested in taking your old computers off your hands. Perhaps they may have sentimental value with a specific computer they used in the office that was recently replaced with an upgraded model. On the other hand, you may have some employees who simply enjoy DIY projects and want to work on breathing new life into the systems in their personal time at home. Either way, this provides you with a solid reward option for an incentive program. For example, you could host a productivity contest that rewards the employee with the most sales/revenue generated within a specified period with an old computer of his or her choice. As your company enjoys a substantial boost in productivity, you will also boost employee morale and engagement by offering this type of incentive. At times, it is easier to rush to buy a new computer than it is to focus on breathing new life into an old one. As you have projected your profits for the year, you may see that you have a substantial amount of money available that can be used to purchase new computers. However, think for a moment of the substantial amount that you will save by breathing new life into your old computers. Depending on the age, model and overall specifications of the system, it may be possible to revive at least a few of your older computers. If the computer still loads in a timely fashion and runs, then it may just need several key components either replaced or upgraded to continually use them without letup. For instance, you may need to just upgrade the memory, disk drive or processor speed. Keep in mind that these steps will not provide you with a “new” computer (or anything close to it.) However, studies have proven that breathing new life into your old computer can save time, money and effort in the long run. You may not be able to save all your old computers this way but reviving even one will still save your business a considerable amount of money. One of the biggest mistakes that you can make when saying “Goodbye forever” to your trashy computer is to forget to transfer all the pertinent data from your hard drive first and foremost. You may mistakenly assume that you have already saved the “most important” files and applications that you need. They may even be saved and stored within the online cloud. Either way, you should never assume that your hard drive is cleared of anything important until after you have personally transferred all the data from it. Whether you handle this data transfer on your own or hire a third-party vendor or contractor to do it, you should never complete any type of major computer overhaul without first working out a strategic plan that specifically addresses your company’s old hard drives. Not only will you save time with this approach, but you can also save a considerable amount of money. In addition, reviewing the older data being saved or transferred may raise your awareness of forgotten sales opportunities, incomplete/unbilled projects or even past clients that you have not contacted in a while. Once you have transferred all the pertinent and necessary data from your hard drives, this does not mean that you have “cashed in” its internal value. If the drive is still operational, you can still breathe life into it and use it as an effective backup storage unit for your business. Instead of paying the premium costs of new external hard drives, you can simply invest in an affordable external enclosure that will allow you to fit your old computer hard drive into it like a puzzle piece. Just because you may have no further need for the computer system itself does not mean that your need for the peripherals (keyboard, mouse, etc.) fade away along with it. You could easily unplug/unpair the device(s) and set them up for use with your newer computer system. This is especially the case with wireless keyboard and mouse sets. By using the same peripheral devices with a newer computer system, you will also be able to boost the performance of your overall system while also preserving your company’s budget for IT equipment. Your company may be done with the old computers, but that does not necessarily mean they are finished for all people. As the old saying goes, “One person’s trash is another person’s treasure.” Once you have transferred all your data and wiped the hard drive clean, consider selling your company’s old computers either to local or online buyers who are willing to pay associated shipping expenses. You could even break it down and sell it for parts if the complete system is not a popular sales item. To save money on your annual taxes, you could even consider donating the computers to a charitable organization.